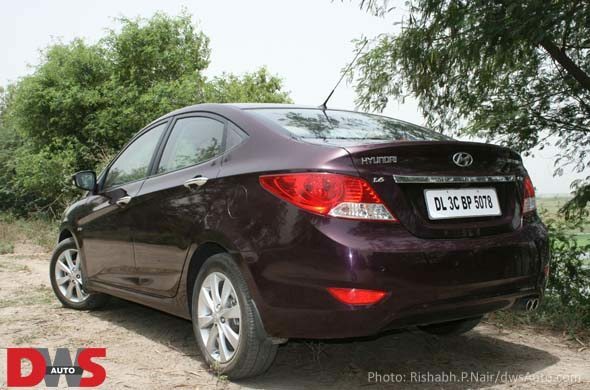 Hyundai India recently launched the new Verna with prices ranging from Rs. 6.99 lakh to Rs. 10.74 lakh (ex-showroom, Delhi). The new 2011 Hyundai Verna is available in 10 trim levels and 6 colors. Hyundai’s new Fluidic Verna has impressive looks and strong design elements, let take a closer look at the car from both outside and inside. 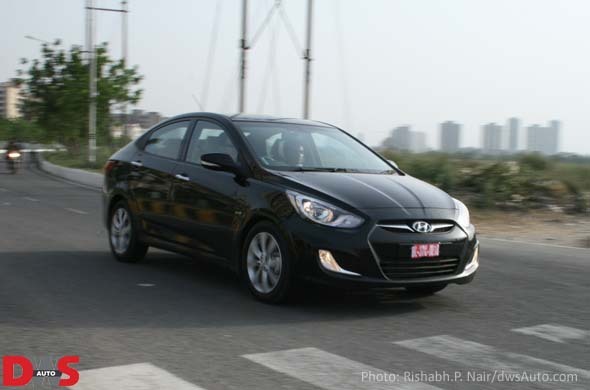 The Verna has an insistent looking front end and Hyundai’s new Fluidic design theme gives the car a purposeful stance. It looks gorgeous with its boomerang shaped fog lamps and ‘eagle eye’ headlamps. The character lines on the bonnet add to the well sculpted front of the Verna and are complimented by the chrome grille that also houses the Hyundai logo. The Side profile of the New Hyundai Fluidic Verna reveals a sharp character line that cuts across the chrome door handles and extend all the way to the rear of the car where they merge with the tail lamp. The side view mirrors house an integrated turn indicator which adds to the cars premium image and further accentuates the fluidic design cues. 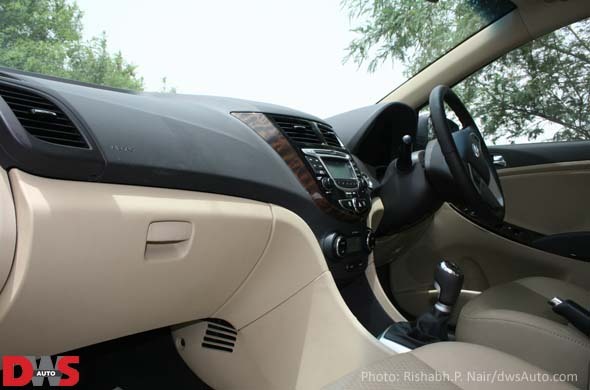 The Verna has plush beige interiors which brighten up the insides of the Verna. The leather upholstery feels luxurious and the seats provide decent under thigh support. The overall design of the dashboard is simple yet elegant and compliments the Verna’s well contoured exterior. The rear of the Verna is also eye-catching but the tail lamps have a slight resemblance to the older generation Honda City’s tail lamps. The Chrome strip on the boot boasts of the cars premium positioning and gives a neat well sorted feel to the car. 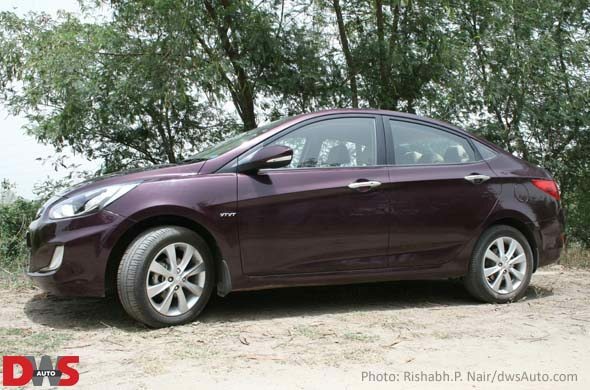 The rear bumper seamlessly blends into the body of the Verna and house small reflectors. 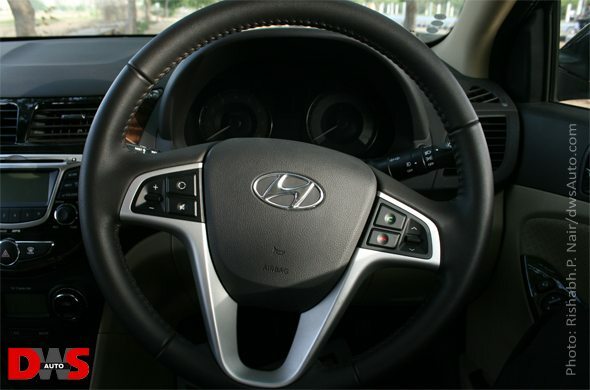 The Verna comes with steering wheel mounted audio controls and call buttons which can be used once the phone is connected to the cars audio system via Bluetooth. The chrome Hyundai logo at the centre of the steering looks elegant and enhances the cars fluidic design. « Will the Honda Brio 1.5 diesel be able to take on the Nissan Micra?